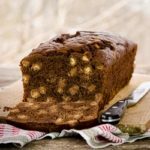 This Chocolate Peanut Butter Chip Quick Bread is a delightful treat or snack for kids of all ages. Serve it and watch the smiles appear! Preheat oven to 350°F. Grease the bottom only of an 8- X 4-inch or 9- X 5-inch loaf pan. Stir together peanut butter chips and 1 teaspoon flour in a small bowl to coat the chips with flour. Stir in the flour mixture until just moistened. Stir in peanut butter chips.